It’s normal for the hotter months to naturally push dinner hours later, and though there are plenty of health and weight loss articles claiming you shouldn’t eat past 6pm, (*eye roll*) going to sleep on an empty stomach is even worse. It’s really natural to eat when you’re hungry, so unless you have particular digestive issues, don’t worry too much about the time you eat, worry more about what you eat and the quantity. The key to late meal times is the recipe. You want foods that are easy for the body to digest, so that sleep is not disrupted as the body works on breaking it down. You should never have to go to bed hungry, so don’t let anyone tell you it’s healthy! Remember not to stuff yourself full right before you want to sleep, as that’s going to make things rather uncomfortable. If you’re familiar with heart burn, you definitely want to leave at least 35 minutes to let the food go down before getting into bed. If you find yourself so tired that you can’t make a solid decision between food or sleep (been there many times), then your best bet is to go with a simple sandwich, slice of toast with scrambled eggs or a bowl of muesli. When it’s that late, breakfast for dinner is the easiest way to get some simple food into your system with minimal prep and cooking time. At that point you’re basically looking to satiate hunger pangs so your stomach isn’t gurgling away as you’re trying to drift off. Great to spruce up or strip down, this recipe can be added, or had as a side next to a main of your choice. 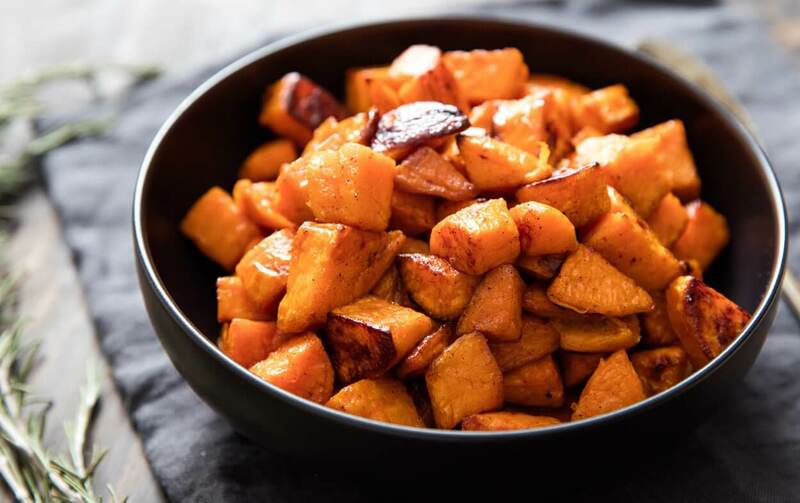 Not only is roast sweet potato recipe incredibly simple to make, it’s also packed full of essential vitamins and minerals and is just as delicious as comfort food, minus all the fat and calories. Winner! Preheat oven to 180ºC / 355ºF / Gas mark 4. Wash and peel the sweet potatoes. Cut into medium size pieces. Place the cut sweet potatoes and olive oil in a glass or non-stick baking dish, and toss to coat with oil. Sprinkle with oregano, salt and pepper (to taste). Bake in preheated oven for 60 minutes, or until soft. Super healthy, elegantly seasoned and yet another quick and easy meal to whip-up when you need a good home made meal in your stomach. This one also makes for a great side dish, and goes well as part of a pasta-bake. You can’t go wrong with pure vegetables. Another winner! 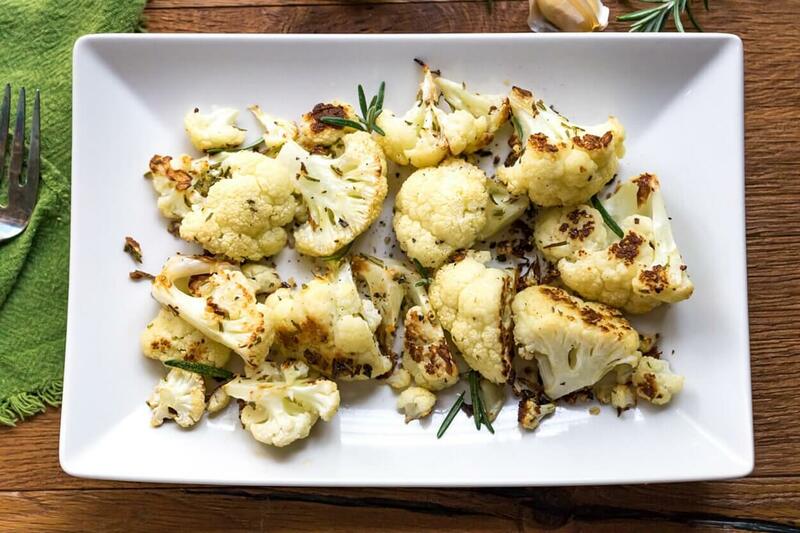 In a mixing bowl, toss cauliflower with oil, garlic, rosemary and salt until well coated. Turn out onto a baking tray, swiss roll tin or roasting tin. Roast, uncovered, at 230ºC / 445ºF / Gas mark 8 for 25 to 30 minutes or until cauliflower is lightly browned and tender, stirring occasionally. 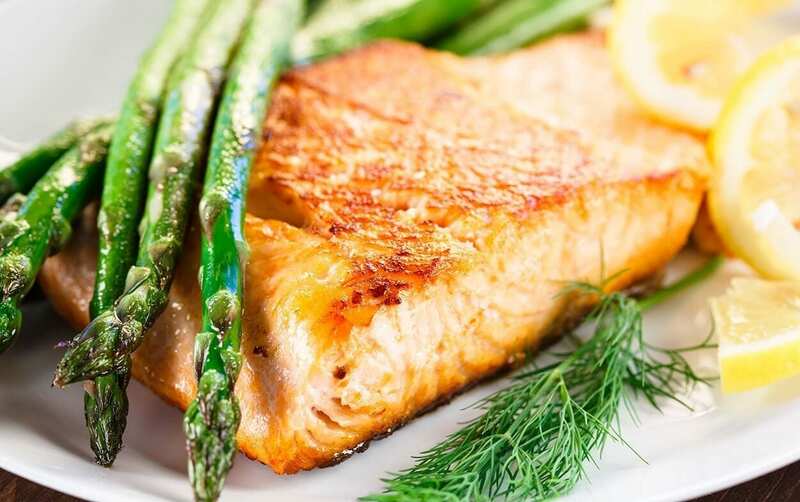 Fish is really easy to digest, as are vegetables, particularly potatoes. This meal can be served as a gourmet dinner-party main, or as a quick late night meal for one. You can totally skip the soured cream, mustard and dill sauce, and just opt for au-naturel instead. Whatever saves you time and hassle when it’s getting late in the evening is definitely a plus, and it will still be a thoroughly delicious meal. Heat the oven to 200°C / 180°C fan / 390ºF / Gas 6. Fill a large pan with boiling water and put a steamer with a lid on top. Steam the potatoes for 15-20 minutes until tender, adding the asparagus for the last 5 minutes (less time if the stalks are particularly thin). Meanwhile, mix the soured cream, dill and dijon mustard in a small bowl with a pinch of salt and pepper and set aside. Heat the olive oil in a large non-stick frying pan. Fry the salmon, skin-side down, for 4 minutes, then gently turn and cook for 4 minutes more or until cooked through. Set aside and keep warm. Pour the sauce into the pan and gently warm through for a minute – don’t let it boil. Serve the fish with the steamed vegetables, then pour the sauce over the fish. A nice change from the norm, and a really clean way of eating. 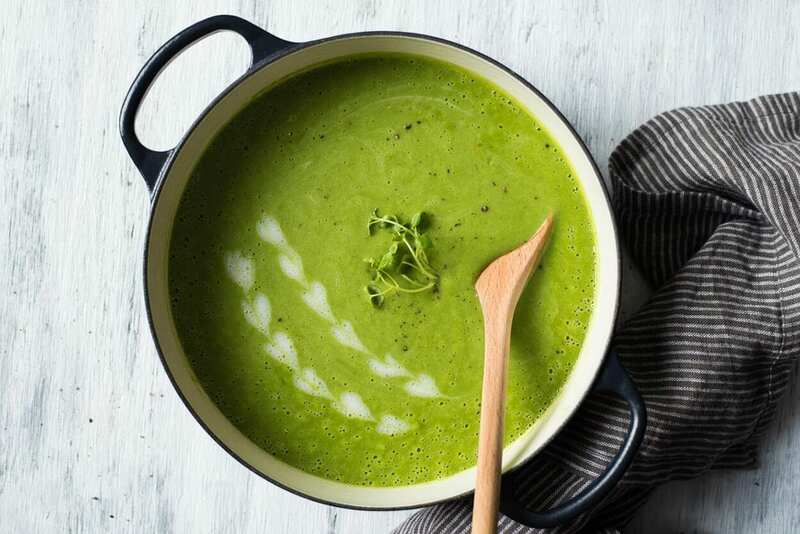 Chocked full of plant-proteins and pretty much any nutrient you could think of, you’re really being nourished with this soup recipe. The meat can easily be left out if preferred, and replaced with some seeds and croutons. Heat the oil and butter in a large pan, add the onion and garlic and cook gently for 5 minutes, until beginning to soften. Add the potato and toss with the onion and garlic, then pour in the stock. Bring to the boil and simmer for 15 minutes, until the potato is tender. Add the frozen peas and simmer for 3 minutes. Add the watercress and stir in until wilted. Remove from the heat, cool for a few minutes then blend with a hand-held blender (or in a food processor, in batches), until smooth. Return to the pan, season to taste with salt and freshly ground black pepper and keep warm over a gentle heat. Meanwhile, preheat the grill to high. Grill the pancetta for 2-3 minutes each side, until crisp. Remove and drain on kitchen paper. Break up into pieces. Ladle the soup into bowls and top each with some pancetta pieces. This surprisingly simple meal has a distinct Spanish feel to it. This makes such a great late night spread without sacrificing variety or flavour. Prawns are actually really light and easy to digest, as are rice and peas. The chorizo is just to add a touch of flavour, but can happily be left out if preferred. Bare in mind red meat is harder to digest, so it’s not recommended to have late at night, especially for people who have sensitive stomachs. However, it would be fantastic for a lunch meal, so I’ll leave it in the recipe for those who love a bit of cooked chorizo. Preheat the oven to 190°C / 375ºF / fan170°C / Gas 5. Lay the chorizo slices on top of each other and roll them up tightly. Cut across the roll to shred the chorizo as thinly as possible. Put the shredded chorizo, garlic and onion in a flameproof casserole or small roasting tin and set over a medium heat. Cook for 5 minutes – there should be enough oil in the chorizo to soften the onion and garlic. Add the rice and paprika, stir for 30 seconds, then add the stock. Bring to the boil, cover and bake for 20 minutes. 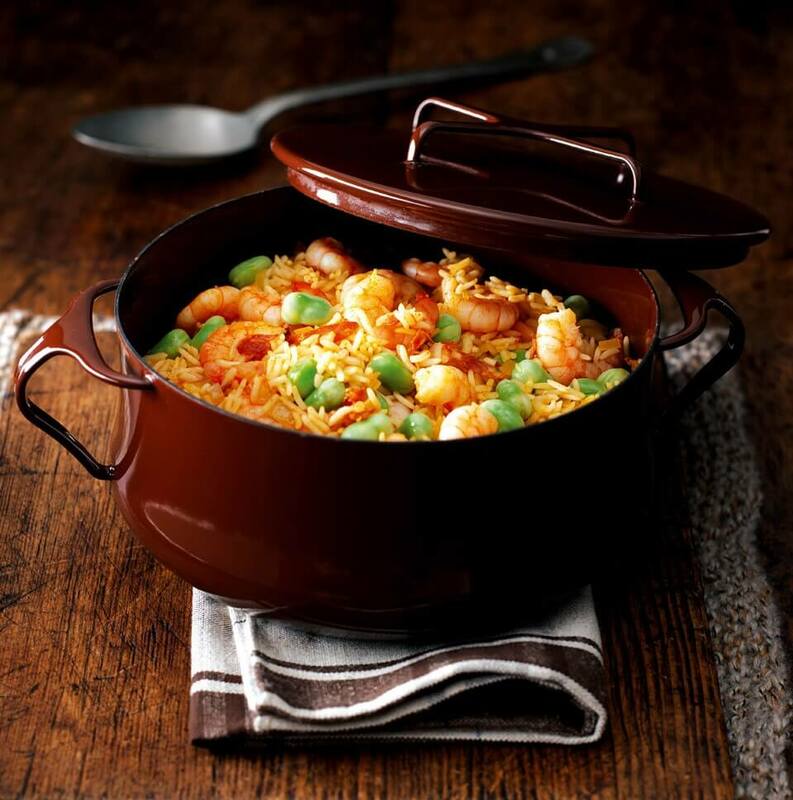 Stir in the broad beans or peas and prawns and return to the oven for 6-8 minutes, until the prawns are pink and cooked through and the rice is tender. Season to taste and serve. Note: If using a small roasting tin, cover the top with a baking sheet when it goes in the oven. If you want to freeze leftovers, make sure you use fresh and not previously frozen prawns. Set yourself up for success with our diplomas that are accredited in 26 different countries. Getting qualified at our school is a completely stress-free process and involves no deadlines, no start-up expenses and no need for travel. Distance learning allows you to study at a pace and location that best suits your needs.